Oxytocin reduces differences in social behavior between dominant and subordinate monkeys, thereby flattening the status hierarchy.Oxytocin also increases behavioral synchrony within a pair, perhaps through increased attention and improved communication. Intranasal delivery of aerosolized AVP reproduces the effects of OT with greater efficacy. Remarkably, all behavioral effects are replicated when either OT or AVP is injected focally into the anterior cingulate gyrus (ACCg), a brain area linked to empathy, vicarious reward, and other-regarding behavior. ACCg lacks post-synaptic OT receptors but is rich in post-synaptic AVP receptors, suggesting exogenous OT may shape social behavior, in part, via nonspecific binding, particularly when available at supra-physiological concentrations. Response: The most important result is that oxytocin and AVP flattens the preexisting dominance order within a monkey colony. 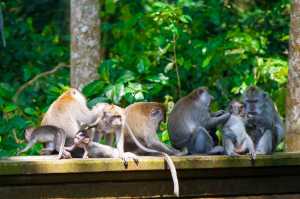 Dominance is a very crucial part of a monkey’s social life, and a lot of resources are devoted to establishing the dominance order and acting accordingly. We found that after OT and AVP treatments the dominance order is flattened, meaning that what used to be very subordinate monkeys become bolder and more self-assertive, whereas what used to be big alpha males become a little more relaxed and easygoing after the treatments. The other really important thing is that oxytocin and AVP can alter the behavior of not only the treated monkey but also his untreated partner, and this is due to the treated monkey exhibiting an increased sensitivity and responsiveness to the other monkey’s behavior. Finally, our injection results together with the inhalation experiments strongly implicate the AVP system in partially mediating the prosocial effects of oxytocin. Response: These findings bear important implications for use of neuropeptides in both basic research and as a therapy for social impairments in disorders such as ASD. First of all our study highlights the importance of further investigating the AVP system as opposed to OT, which up to this point has received the most attention in human literature. Our study also clearly demonstrates that changing the behavior of one individual through neuropeptide treatment will in turn alter the behaviors of those around him/her, thus changing the overall social environment. It is therefore important for future studies of neuropeptide function to include large groups of subjects and measure behavioral changes in the entire group. This entry was posted in Author Interviews, Endocrinology, Social Issues, University of Pennsylvania and tagged neurobiology, oxytocin, social studies by Marie Benz MD FAAD. Bookmark the permalink.